Show forth thy endless faithfulness. Had fled the idols heaped within. And wrapped his wife with mourning band. No issue of their line was left. Rose up, restored, no longer lame. Now that she could be made no less. Let go, dear ones, of my poor hem. Husbands may the Lord give you! Forsook by God, his wrath my due." She walked and wiped away a tear. Ruth was next: "Return with her!" And cast off Chemosh and her fear. If I leave you, God strike me dead! I'll share the grave that falls your due." A faithful daughter, years full ten. The hills with fearful beasts now teamed. And of their presence gave no trace. That inns along the way all fined. "Take your mount, and do not fear!" He said though he had naught to gain. With fear of God he was embued. The old widow she shed tears anew. "Naomi's back! O come and see!" The news spread fast, a windy gust. A widow's weed entwines my frame. My lord, my sons, and robbed me poor!" She paid with rings cut from her ear. Gleaning in the fields about." As evil men their favors bid. A humbler man yet was there none. "El Shaddai be with you men!" "The Lord bless you, O Head of Ten!" "Who be this?--the one not paid?" As Ruth lay down her gleanings spare. The Moabitess first asked me." Your honor's safe, no man offends!" Ruth then fell with head bowed down. "O Sir, why notice take of me? And idols nursed me on their knee." "All was told me," Boaz said. "El Shaddai, I pray, bless you! You strive to aid your mistress too." For this no maid of yours I be." Dip your morsel in the wine." So on parched grain she fully fed. From sheaves pull out some grain, I mean." Was much to bear on her home route. Who favored you as God blessed Job." 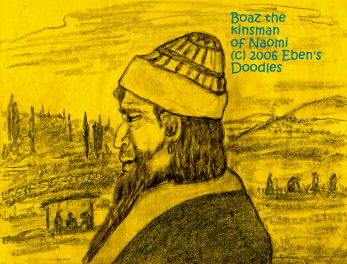 Boaz is the man's own name." "This man," she cried, "of our line came." And from the heads all chaff she cleaned. "Daughter, may I serve you well! Draw up close, and I will tell. The threshing floor to him was lent. When he lies down to rest his knees. He will tell you what to do." And chose a gown of purple hue. 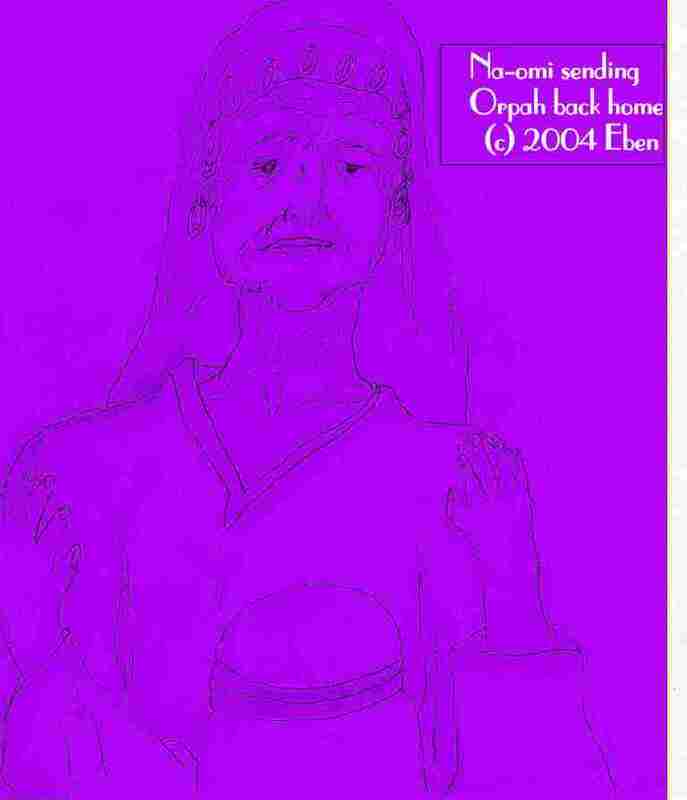 She fled from Ehud, palace, hill. Now fell unnumbered as the sand. Gave up right to his own loin. "God bless you with his favor! Now I will help you as I ought. So have no fear in all your heart! For working out what honor gained." A beauty that matched hers at heart. "Wait this day, for time will tell,"
Poor Mahlon's land!) all this in truth." Restore the Dead with his own fat. On Mahlon's grave through Ruth's womb-well. That Boaz bought Mahlon's wife too. I'll wed the dead son's wife as due." Was passing through with camels bare. But something in his heart did hop. With love that shone just like a star. The two proved strong, no longer bare. He felt his heart begin to laud. "O grant me, Lord, one look at them!" And carry home what grain was best. He bought (not barley!) wheat like gold! His camels heaped 'til all was sold. Who praised the Lord with faith not half. Build up your house as with Perez!" 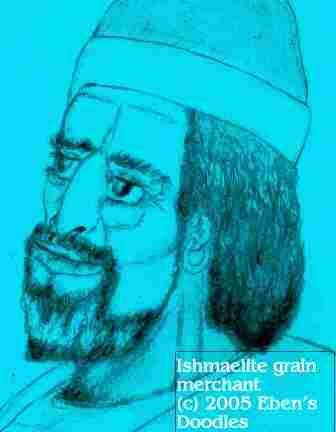 In Ephratah your wheat heap high!" Where Boaz sat with heart that leapt. Give sons to you without surcease!" And she conceived in a day. O blessed be the Lord today! May your old age be nourished too. "And who is like our God the Lord? His steadfast love for those who trust. To sit with princes of his land! And gives her children by his hand. On you this daughter's love outpours." 'Twas then the widow ceased to grieve. And cared for him most tenderly. Unknown to them would gain great fame. Who one day conquered all man's foes. Where there was none a Star did blaze. El Shaddai--Most often translated "Almighty," this Name of God contains a richer meaning, denoted by the Hebrew base word, "shad," which means "breast." This great, transcendent, almighty One is a nurturing, life-giving, loving Source of life to all who draw their life from Him! Thus, El Shaddai is the God of Ruth and Naomi, amply proven by the events of the story and Ruth's own character, which in most significant ways reveals her as a Type of Christ, the True Vine, for Whom she was grafted into the Vine of Israel in order that she might become Jesus's own fore-mother in the royal line that led to Christ. 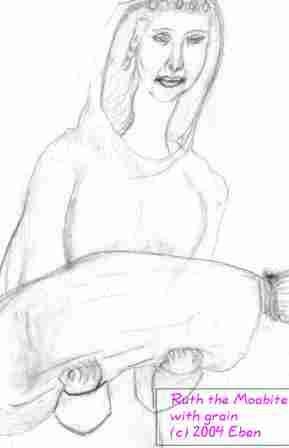 Rahab--The harlot of Jericho who sheltered Joshua's spies in her house; she was saved when Jericho fell to the Israelites led by Joshua, and she married a prince of Israel, Salmon, thereby being grafted into both the Vine of Israel and into the Line of Christ. Ruth--A young Moabite woman who became an ancestress of King David (and Christ, born in the royal line of David through Mary) through her second marriage to Boaz, Rahab's son. Her story is told in the OT Book of RUTH, and the events occurred during the time of the Judges of Israel (Ruth 1: 1) As a Messianic forerunner, she exemplifies the Christlike characteristics, very strongly, of selfless love, longsuffering, kindness, devotion to a loved one, humility, and mercy. It impossible to imagine a more perfect individual than Ruth.